Background: Physical inactivity ranks as a major contributing factor in the development and progression of chronic disease. Lifestyle interventions reduce the progression of chronic disease, however, compliance decreases over time and health effects only persist as long as the new lifestyle is maintained. Telephone counselling (TC) is an effective way to provide individuals with ongoing support to maintain lifestyle changes. Remote physical activity monitoring and feedback (RAMF) via interactive technologies such as activity trackers and smartphones may be a cost-effective alternative to TC, however, this comparison has not been made. 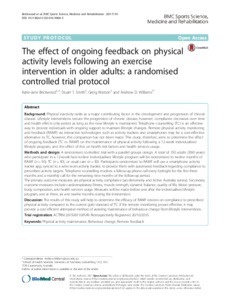 This study, therefore, aims to determine the effect of ongoing feedback (TC vs. RAMF) on the maintenance of physical activity following a 12-week individualised lifestyle program, and the effect of this on health risk factors and health services usage. Methods and design: A randomised controlled trial with a parallel groups design. A total of 150 adults (≥ 60 years) who participate in a 12-week face-to-face individualised lifestyle program will be randomised to twelve months of RAMF (n = ), TC (n = 50), or usual care (n = 50). Participants randomised to RAMF will use a smartphone activity tracker app, synced to a wrist worn activity tracker, to provide them with automated feedback regarding compliance to prescribed activity targets. Telephone counselling involves a follow-up phone call every fortnight for the first three months and a monthly call for the remaining nine months of the follow-up period. The primary outcome measures are physical activity compliance (accelerometry and Active Australia survey). Secondary outcome measures include cardiorespiratory fitness, muscle strength, dynamic balance, quality of life, blood pressure, body composition, and health services usage. Measures will be made before and after the individualised lifestyle program, and at three, six and twelve months during the intervention. Discussion: The results of this study will help to determine the efficacy of RAMF devices on compliance to prescribed physical activity compared to the current gold standard of TC. If the remote monitoring proves effective, it may provide a cost efficient alternative method of assisting maintenance of behaviour change from lifestyle interventions.